Percent change is reported based on unrounded visit counts. ED visits with an expected primary payer of other or missing are not shown. 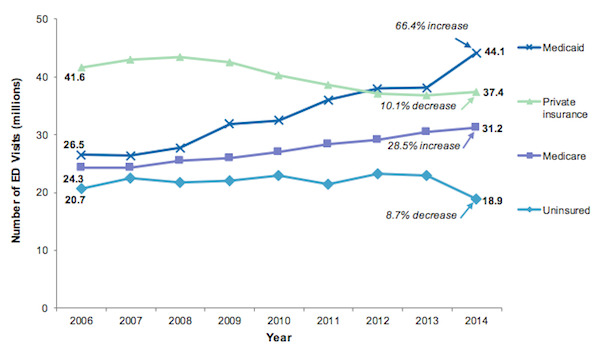 Data Source: Agency for Healthcare Research and Quality (AHRQ), Center for Delivery, Organization, and Markets, Healthcare Cost and Utilization Project (HCUP), Nationwide Emergency Department Sample (NEDS), 2006–2014. This entry was posted in Data Watch on September 20, 2017 by Genevra Pittman.